Hope you're all keeping warm... Reminder that we have a very inviting jazz workshops this Spring at Seven Arts, Chapel Allerton in Leeds from 2 pm to 4 pm. Cost £10/£8 concession, as usual. Our tutor this season is the wonderful sax player Will Howard, who will I think be leading us through a lovely standard or two. Do hope you can join us. If you know of people who are interested to come along and see what our workshops are like, do tell them they are welcome to listen the first session if they wish (but nice if they play). We're having some changes of tutor this term, owing to Robin (Porter) having to tear himself away and do some work on a Caribbean cruise... And Will Howard is now going on a tour of Holland at the beginning of February, for a month! 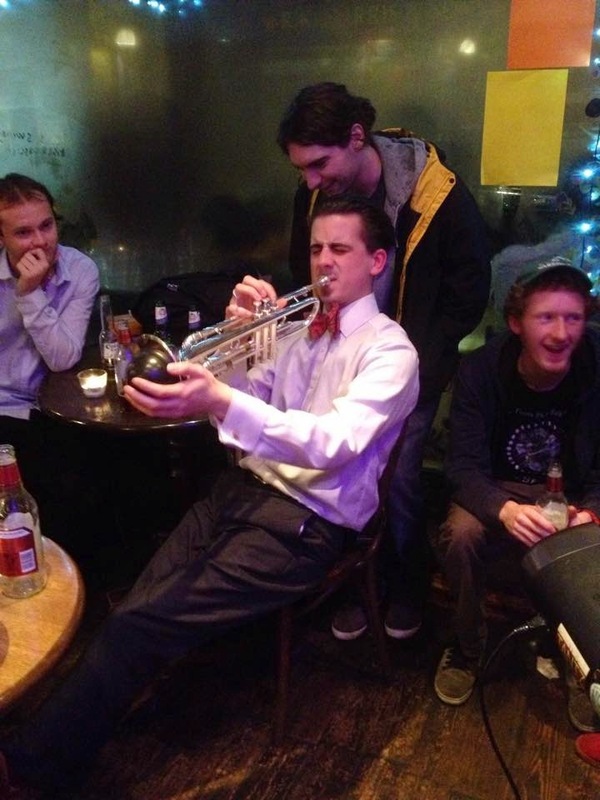 Dominic is trustily doing his share of the workshops, and we now have a guest tutor on Saturday 21 February - Tom Sharp who is a wonderful trumpet player. You can catch him playing with 'Coney Island Babies', our support band for our Liane Carroll gig @Seven Arts next Thursday, 5 February (tickets selling fast, if you haven't yet decided). Look forward to seeing you, at workshops and/or our gigs! Keep supporting live music! Thursday 12th February 9.00pm – Stuart Davies and The New Standard £5.00 on the door Groove and R&B with just enough jazz. Dance if you want to. “This was an experience! Quite a band.” Bebop Spoken Here. Friday 13th February 8.00pm – Bradley Johnston Quartet £5.00 (£3.00 before 7.30pm) Young guitarist with growing reputation heads contemporary outfit. Saturday 14th February 9.00pm – Mark Williams / John Pope Duo Admission Free.Music inspired by the great guitar/bass duos from two of Newcastle’s finest musicians. 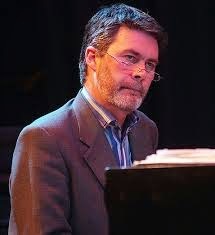 Friday 20th February 8.00pm – The Noel Dennis Trio £5.00 (£3.00 before 7.30pm) North super group explores the music of Miles Davis, Bill Evans and other US star names. 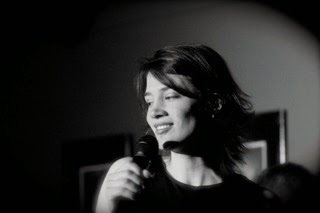 Saturday 21st February 9.00pm – Zoe Gilby / Andy Champion Duo. Admission Free This innovative voice and double bass duo inspired by the legendary Sheila Jordan has been taking audiences by storm throughout the UK and Europe. 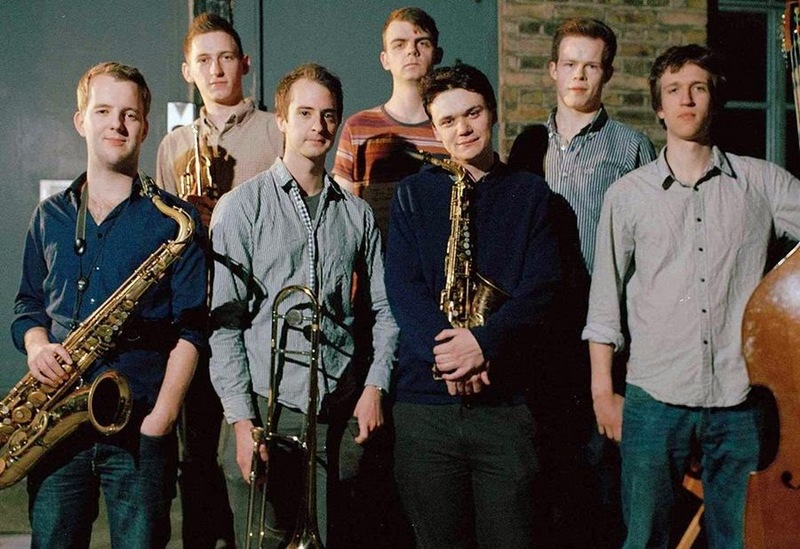 Tuesday 24th February 8.00pm – Schmazz presents The Tom Green Septet £10.00 & £8.00 conc. on sale in adv. from the Jazz Cafe 0191 222 9882 and from Reflex Records 0191 260 3216. 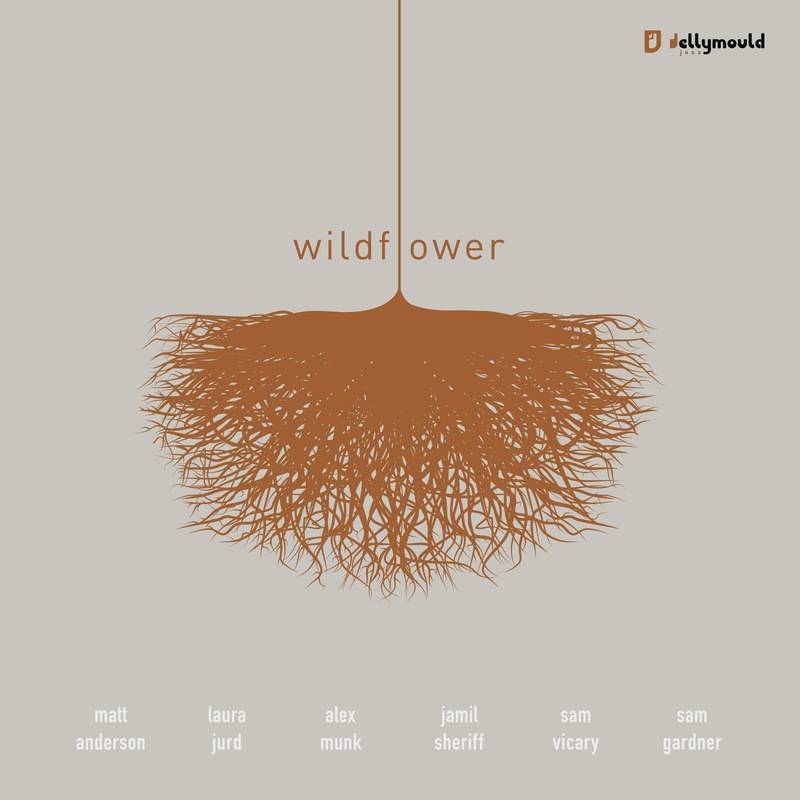 Winner of the Dankworth Composition Prize and named ‘one to watch’ by Jazzwize Tom Green writes music which combines striking melodies, colourful harmony and propulsive grooves. 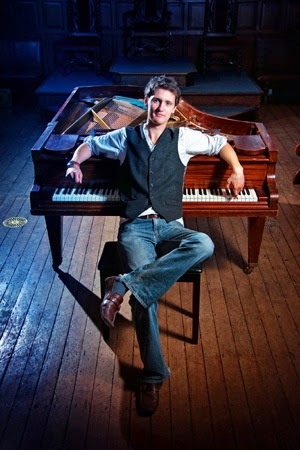 Saturday 28th February 9.00pm – James Birkett / Giles Strong Duo. Admission Free Djangologie’s acoustic guitar stars go electric and tackle a wider jazz repertoire. Spring calls at Huddersfield Jazz..
As it’s only five weeks to the start of our Huddersfield Jazz Spring season I thought it was time to let you know what’s in store over the next few months so that you can plan your social calendar (for those of you who have one!). The four artists we’re presenting are featured on the attached poster, and we think that they will all continue to maintain the standard you expect at Huddersfield Jazz. On 9 May, we're back at the Lawrence Batley Theatre for the Kit Downes Trio. Kit is a graduate of the Royal College of Music, and was one of the original members of the most forward-looking of UK bands, Empirical. 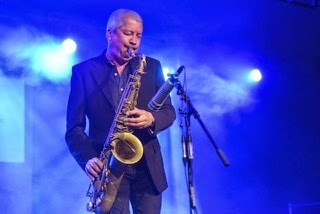 After leaving that band, he formed the progressive jazz group Troyka, who played at last year’s Marsden Jazz Festival. Here, though, you’ll find him in trio format playing his expressively original compositions with passion and commitment, marking him out as a significant figure on the UK jazz scene. Finally, on 6 June, it's back to the Keys Restaurant, for Unfurl, a five-piece band who combine Indian ragas, contemporary jazz, flamenco and Arabic rhythms to create an uplifting fusion and original sound. I hope you’ll all agree that this is a suitably appetising programme for our Spring season, and I hope to see you there! The next two gigs in the Jazz Bar at the Globe in Newcastle demonstrate the wide spectrum spanned by local jazz. 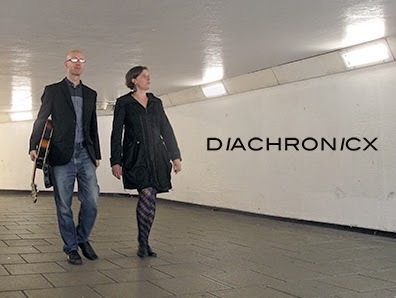 On Saturday 31 January we present Diachronicx, a duo of Gabriele Heller (vocals and electronics) and Steve Glendinning (guitar). 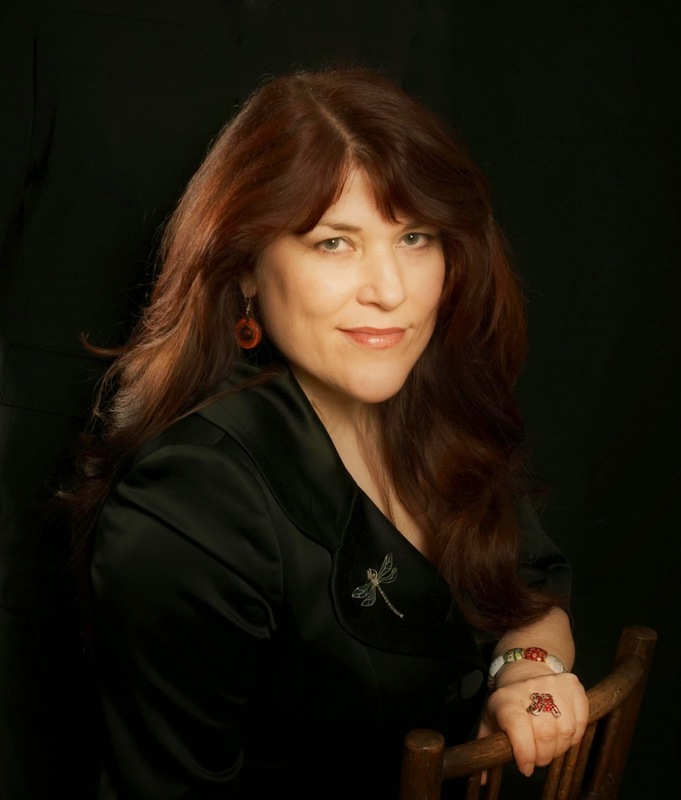 Gabi is well known for her work with experimental theatre. 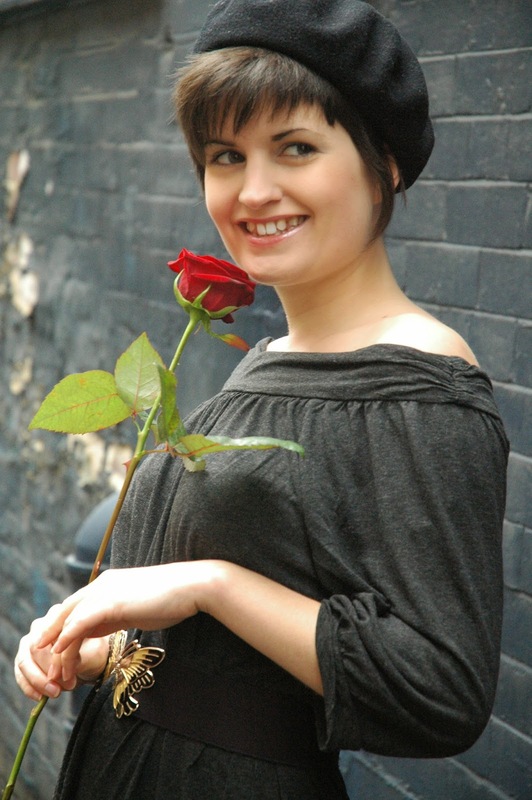 She burst onto the Newcastle jazz scene in late 2011 with Nat King Cole style trio called Gabriele Mit Drei. Diachronicx is her latest project (again with jazz guitarist Steve Glendinning) that includes ‘original songs, jazz standards, blues, poems and more around the theme of the Great City’. Prepare to be amazed, intrigued and entertained. On Saturday 7 February, one of the longest established bands in Tyneside jazz comes to the Globe. The Safe Sextet, led by post-bop trumpeter and arranger Don Forbes, used to play every Friday for nearly 20 years at Keith Crombie’s Jazz Cafe. Several members of the band helped to set up the Jazz Coop when Crombie died. We are delighted to welcome them to the Globe. They will be playing tunes composed by Stan Tracey, Mike Carr, Lee Morgan and McCoy Tyner together with some original tunes by Don Forbes. Liane and Chloe headlne@Seven Jazz Leeds! Two talented women in the jazz world headline at Seven Jazz Leeds in February. Liane Carroll, who has won many jazz awards with her soulful voice and piano is at Seven Arts on 5th Feb, then BBC New Generation Artist saxophonist Trish Clowes, brings her stunning band featuring pianist Gwilym Simcock and guitarist Mike Walker to Seven Arts on 26 Feb.
Also this coming month there is young trombonist Tom Green with his London based septet on 25th Feb at Seven Arts, our new Inkwell jazz jam session on 15th Feb, a welcome return of veteran UK guitar fusion legend Gary Boyle with his special quartet at Seven Arts on 8th Feb, and to start with this coming Sunday afternoon 1 Feb at Inkwell a real treat as we feature American trumpet star and jazz educator from Georgia State University, Gordon Vernick. Come and enjoy it all! Top British jazz fusion guitarist and local hero Gary Boyle (ex Isotope, Triple Echo, and albums like Electric Glide) to bring his quartet to Seven Arts - featuring Jonathan Hartley on drums, Ed Harrison bass, Andrzej Baranek keyboards. Bring your horn, your axe, voice or just come and listen to the fun! Spanish born and Leeds based jazz pianist Victor Gutierrez to lead the rhythm section trio. You can purchase tickets on the door if not sold out. But the BIG NEWS is confirmation of the biggest & best programme for the 6th Annual Festival 1/4 May 2015. Stacey Kent heads up the headliners, accompanied by Andy Sheppard, Soweto Kinch, Alan Skidmore Quintet, and Paul Rigby’s Northern Jazz Orchestra with Georgina Jackson, all appearing at The Grand, ‘The best small theatre outside London’ - James Taylor. Jazz North’s bands Dread Supreme, John Ellis Trio, and Unfurl, bring Northernline quality to the Atrium Cafe Bar. Inspired Manchester-based band, Baked a la Ska, ensure a lively late-night dancing gig. Festival Fringe gigs feature on all 4 days in hotels, restaurants, pubs and villages. Street Festival Saturday promotes youth bands in Clitheroe’s main street which is closed to traffic. Bank Holiday Sunday & Monday sees 10 bands on Clitheroe Castle’s outdoor bandstand. The Festival gives plenty of choice in live music with crossover arts activity complimenting a strong jazz programme. Hence 4 bands appear on the three year old Blues Stage, and two bands start the first Soul Stage. The festival programme has strengthened in recent years thanks to private and public sector support. Unistage, the festival’s main sponsor, provide bespoke staging solutions for the festival. Arts Council grants have given Ribble Valley Jazz & Blues confidence to expand an ambitious festival that brings social, cultural, and economic benefit to jazz communities, and to Clitheroe and Ribble Valley. There are just 17 tickets left for this gig!! Norwegian Marius Neset, appearing with fellow countryman Daniel Herskedal at 2.30 pm on Sat 7th Feb has just awarded Norwegian Grammy equivalent. Marius Neset & Trondheim Jazz Orchestra were awarded the most important Norwegian music award for their critically acclaimed album "LION", the Spellemannprisen, Norway´s equivalent to the GRAMMY®. The prestigious and multi-genre award was presented in an awards ceremony last Saturday and broadcasted live on national Norwegian television to hundreds of thousands of viewers. On 30 January Marius Neset will release his new album "PINBALL" (ACT). Besides himself on tenor and soprano saxophones it features Ivo Neame on piano, Jim Hart on vibes, Peter Eldh on bass and Anton Egger on drums and as co-composer. Further guest appearances include classic cello virtuoso Andreas Brantelid, Ingrid Neset on flute and Rune T. Sorensen on violin. From February 7 onwards Marius Neset and his quintet will be on tour until the end of the year including a gig at Leeds 7 Arts on April 16th. There are only 23 tickets left for this one at the Winter Weekend at The Royal Clifton Hotel Southport PR8 1RB!! A swinging and melodic guitarist, Jim has played with Scott Hamilton, Guy Barker, Alan Skidmore and Snake Davis. 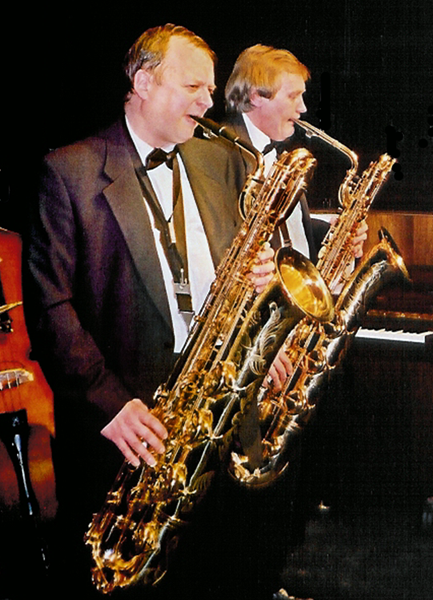 After studying at the Leeds College of Music at the same time as Alan Barnes and David Newton, Jim went on to gain a Phd in teaching jazz improvisation. 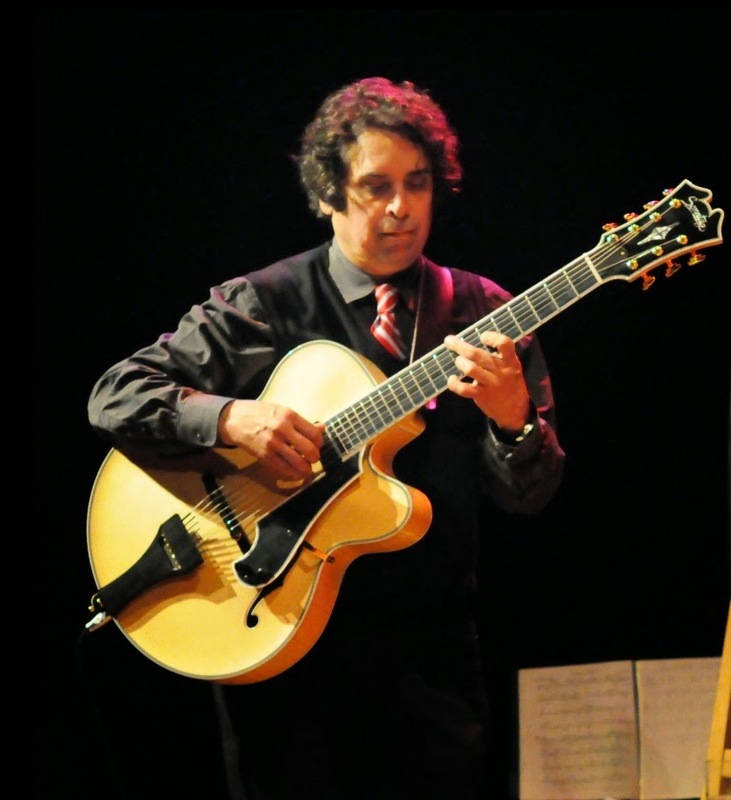 Since retiring from his educational work, Jim is even more active on the jazz scene, leading a trio, working as a duo and playing with the gypsy jazz group Djangologie. For this gig he is a soloist with the resident Mike Gordon trio. £4. February jazz at Wilmslow and Cheadle Hulme. Graham Brook brings you up to date with what's happening at Wilmslow and Cheadle Hulme. "Tuesday Jazz and Swing" every Tuesday night upstairs at Wilmslow Conservative Club, 15, Grove Avenue, Wilmslow SK9 5EG. 8.30pm start. £7 on the door. This is one of the youngest groups appearing at the club in 2015 but there are several more support acts to follow in the following months. The Jam Experiment are not only providing the support act, for 7 Pieces of Silver at the Club on 11th March but also leading a workshop at Franklin college during the afternoon. 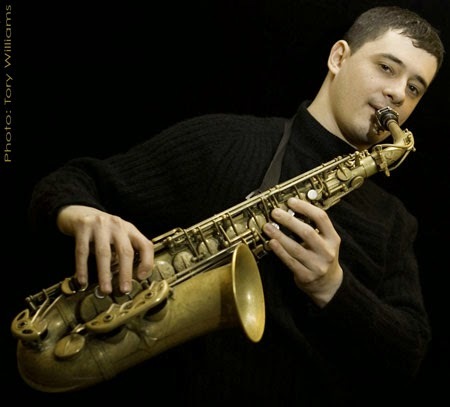 We also have Will Howard, ex Leeds College of Music saxophonist coming 22nd April supporting Swiss trio "Vein". All the Acts have been finalised for Cleethorpes Jazz Festival 26th, 27th & 28th June, so watch out for the Festival postcards circulating the country! Tickets available from Available from Gill Wilde 68 Welholme Ave Grimsby DN32 0BP Tel: 01472 873730. Please make cheques payable to GRIMSBY JAZZ. As always, the club meets on the last Sunday lunchtime of the month, with a 12:30pm start. Our session on February 22nd certainly fulfills our mission to bring the best of regional and national jazz to Wigan - Phil Shotton brings his SWINGSHIFT BIG BAND, always popular visitors to the club, but this time featuring the UK's number one big band drummer and bandleader PETE CATER. The venue, as always, is Whelley Ex-Servicemen's Club, in Vauxhall Road, Wigan WN1 3LU. Admission is £11, £10.50 for concessions and £10 for Wigan Jazz Club members - no need to book, just pay at the door. Sue Barron is a local singer who has been performing with her band of excellent musicians in the North West and beyond for a number of years. They have performed at the Cinnamon Club many times. The repertoire is a mixture of Jazz Standards, some lively latin numbers, some familiar more contemporary songs and beautiful ballads. The Magic Beans are a band with an ear for a quirky cover and have the imagination to take it in a completely new direction. Also incorporated into the mix are some rootsy originals that draw influence from folk, jazz & world music traditions. Uli Elbracht & Matt Owens are self-effacing accompanists: they provide minimal velvet for the jewel of Zoe Kyoti’s voice, which is magical in its smoothness, nuance and tenderness. They have performed throughout the UK with appearances including The Manchester Jazz Festival, Rainow Jazz Festival & Zeffirellis Ambleside. While his heart belongs to jazz, Theo Jackson’s soul lies in music which has the ability to cross boundaries and genres, appealing to a wide audience. A storyteller by nature, many of his songs are observations of people from his home-town of London. Newly signed to US label Dot Time Records, this engaging and charismatic British jazz songwriter will be releasing his first album in April 2015. "Shoeless and the Girl" features 10 original songs, ranging in approach from jazz arrangements to solo piano and voice. The album will also feature an adaptation of Wayne Shorter's 'Footprints'. Two of Manchester’s finest guitarists get together for a gig that will be a joy for all their fans. Differing styles “mesh intuitively” says Mike Butler who has followed these musicians for years. Saturday 28th Mads MathiasAlready somewhat of a star in his native Denmark, Mads Mathias is a vocalist/songwriter and saxophonist, who has captured the hearts of music lovers with his charismatic performances, spirited personality and entrancing original songs with the feel of timeless swing-era classics. Perform at Lancaster Jazz Festival! Lancaster Jazz Festival is now open for artist submissions for their open programme during the annual contemporary jazz festival held in the centre of Lancaster between the 17th and 20th September 2015. 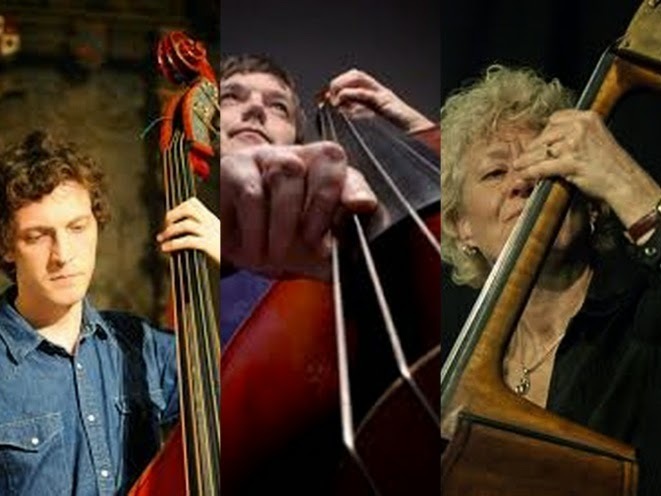 The submission process is quick, easy and open to all artists - follow the links at www.lancasterjazz.com before the deadline on Friday 27th March. Surrounded by the beautiful Yorkshire Wolds, the Festival is set in the award winning grounds and Great Hall of this stunning Elizabethan stately home, which has stayed within the Cunliffe-Lister family for more than 400 years. Fifteen generations have filled the Hall with treasures, from magnificent carvings commissioned when the Hall was built between 1598 and 1610 by Sir Henry Griffith, to French Impressionist paintings, contemporary furniture, tapestries and other modern artwork in recent years. Tickets are now on sale from here http://www.burtonagnes.com by telephone 01262 490324 (weekdays 9am-5pm), or from any of the shops at Burton Agnes Hall. Early bird tickets are currently on sale and priced at £60 for the full weekend; children under 12 are free with an adult. Concessions: OAPs, Burton Agnes Hall members, students and children aged 12-15 are £58. 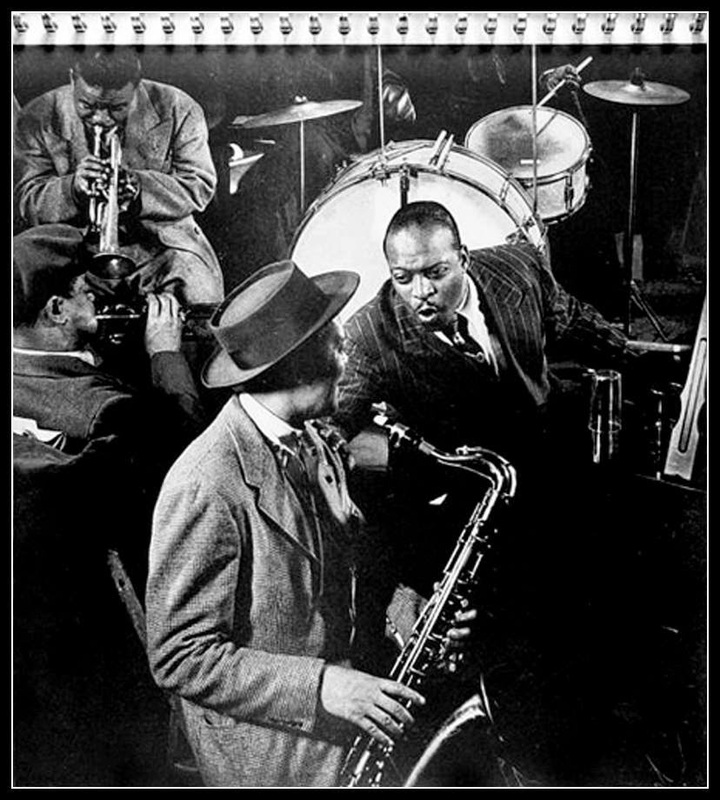 Learn more about jazz improvisation! Hey you - FOUR opportunities to learn more about jazz improvisation! 1. Half day workshop at HEART led by Matt Roberts on April 25th from 2.30 - 4 p.m. Cost: £15. 2. Weekend workshop at DALESBRIDGE near Settle with Matt Roberts, Sam Watts (and possibly Sam Gardner too). May 8th - 10th Cost: £250. 3. Summer school at HEART led by Matt Roberts and Matt Anderson.3rd - 6th August inclusive. Cost: £200 (accommodation, food, tuition). - book early as places are limited! Sad news to pass on to you. Dave Hatfield, the organiser of Fusebox in Leeds and one of the leading lights behind the former Leeds Jazz died on Monday this week. Dave requested that a New Orleans inspired procession lead his hearse through Chapel Allerton, stopping at Seven Arts in Chapel Allerton, before the funeral, from around 2pm. The funeral will be at Rawdon Cemetry in Leeds on 29th January at 3pm. At 4.30pm afterwards there will be a celebration of Dave’s life at Seven Arts, with lots of music, to which everyone is very welcome. 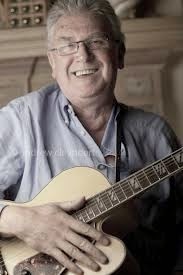 Dave’s co-promoter Bill Chatwin at Fusebox has posted a tribute on http://www.fuseboxleeds.org.uk/?p=1175. Ten Wakefield gigs get the Jazz year going with a bang! The Wakefield Jazz programme for January to Easter has singers, star soloists and a range from swing to contemporary jazz. We are particularly happy to be the only club to bring certain bands to the North of England providing a unique opportunity to hear them. First in that category is Laura Jurd’s Human Spirit on 30 January concluding their 11 date tour on their way home from Scotland. The inclusion of the startling singer Lauren Kinsella and veteran second trumpet Chris Batchelor makes this a flexible and intriguing band. Next is the “at last” debut band led by bassist Alison Rayner featuring Steve Lodder, Deirdre Cartwright and Diane McLoughlin. These Blow the Fuse musicians are rarely invited out of London and make a special trip to visit Wakefield on 20 February. Another bassist with an unusual band is Andy Cleyndert who brings the de Jong Cleynderts on 27th February with Ross Stanley and Martin Shaw. 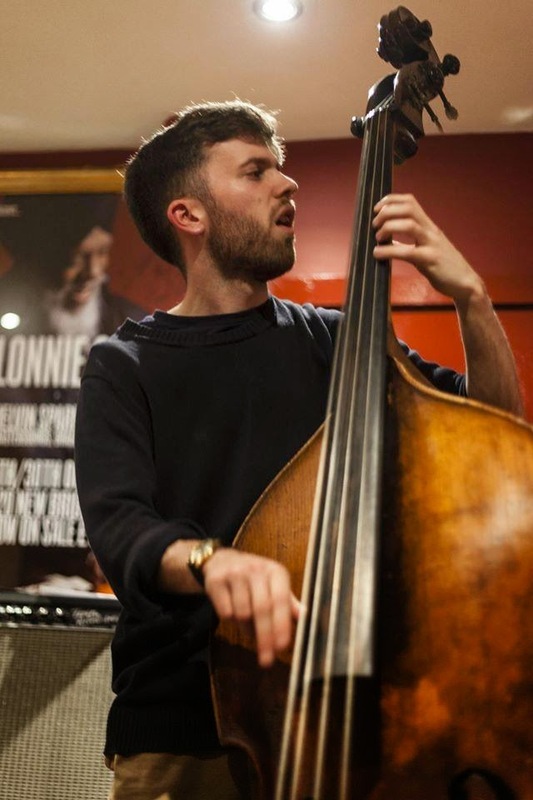 Yet another exceptional bassist is the prodigal son of British Jazz Phil Donkin with his international quartet on 13th March. This talented Maccem left for New York some ten years ago and then as his international reputation burgeoned based himself in Berlin. His long awaited return to the UK visits Wakefield at the climax of his release tour of the album “The Gate” – look out for U S drummer Colin Stranahan. The American Tim Armacost plays second tenor with Alex Garnett in his Bunch of Five on 23 January, a really exciting band with Liam Noble, Mike Janisch and James Maddren. Zoe Gilby kicks things off on 16 Jan.; Alan Barnes on 7th February (note, a Saturday) followed by David Newton’s new Big Screen trio on 13th February. Guitarists Mike Walker and Stuart McCallum on 6th March and singers Beverley Beirne and Esther Bennett on 20th March complete the offering. 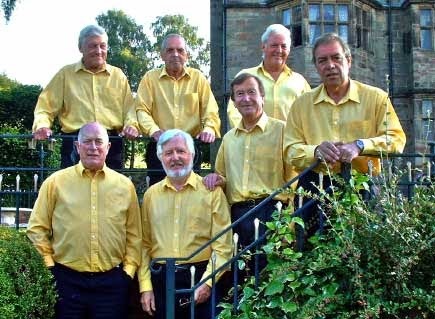 17th – Andy Henderson Swingtet – here’s a nod towards the quartets and quintets of the 40s and 50s and the standards made famous by the swing bands of the era. 31st – Mart Rodger Manchester Jazz – here’s more enjoyable sounds by one of the most respected traditional jazz groups in the North. 7th – Frank Brooker’s Happy Chappies – this one is close to home. Our local hero, Frank on reeds, leads a line up of local worthies including Greg Wadman on trumpet, Jim Wright on banjo/guitar, Phil Kampen on bass and all driven along by our favourite drummin’ man, Rod McNamara. 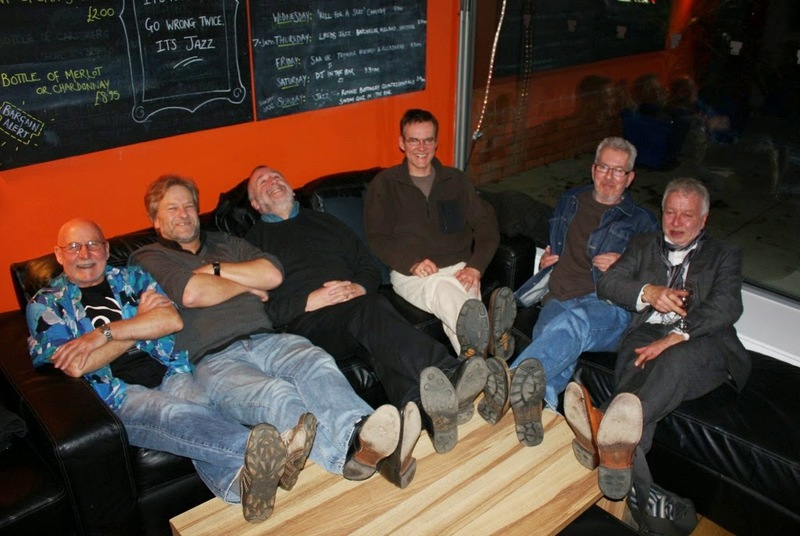 14th – Maine Street Jazzmen – and to help drive away the wintertime blues, one of the most stimulating traditional jazz bands in the North which has quickly established itself as a Boston Spa favourite. 21st – Boston Spa Real Ale Festival – featuring Ron Burnett’s Mardi Gras Jazz Quartet. No evening session this week as the Hall is transformed into a Mecca for Real Ale enthusiasts with over 30 ales to choose from. The Mardi Gras Quartet will be on stage from 2.00.pm to 4.00.pm – sponsored by Jazz in the Spa. The Festival opens at 12 noon and entry is £5 to include a Festival glass. 28th – Spirit of New Orleans – and to round off the month, a highly regarded Yorkshire based band with a delightfully relaxed, wide ranging and distinctive style. 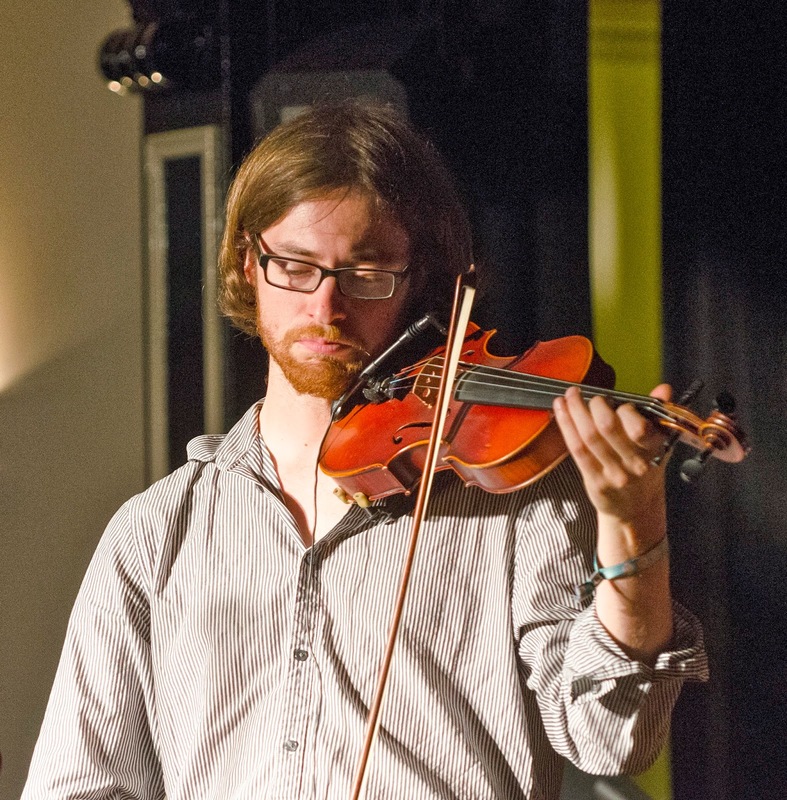 Tom Rivière Quartet- January 24th 2015 7.30 p.m. Playing new compositions from the leader and songs from the past. The music echoes old ballads, appropriates familiar structures and delves into more abstract places. Don't forget on Monday (12th Jan) we resume our workshops for all adult amateurs. For five weeks we have the talented Will Howard with an Ellington and Strayhorn series of workshops. The workshops last from 7.30 to 9 and cost £8 per session. Just turn up! Matt Anderson will be back after his triumphant tour!" "Tuesdays at the Brasserie will feature a guest instrumentalist along with the Watermelon Men. Yes, back to the four piece line up of guitar, piano, bass & drums.How can we afford it you may ask? Well we can’t without your support and generosity with the raffle, so please come along and bring a friend or two if you can. It’s still free entry"
Tue 10th Feb - Harrogate Brasserie, free entry 8.15pm - The Watermelon Men + guest t.b.c. Tue 24th Feb - Harrogate Brasserie, free entry 8.15pm - The Watermelon Men + guest t.b.c. 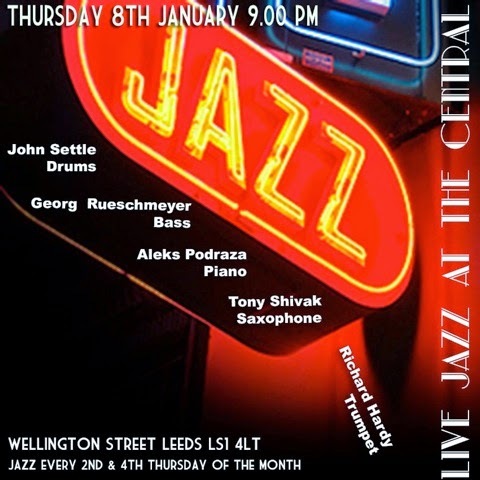 Richard Hardy writes- Jazz at the Central (Wellington Street in Leeds LS1 4LT) is back Thursday evening 8 Jan at 9pm. Scarborough back in the groove..